Would you like that “old world” feel on your modern, 21st century back deck? Then your deck needs a pergola! 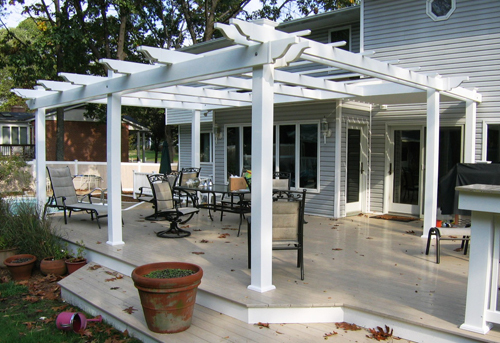 A pergola will add that touch of class and sophistication your deck has been missing. There has been an increasing demand for these beautiful structures, so Mid Atlantic Deck and Fence has decided to make them available to customers in kit form. Our vinyl pergola kits are constructed using the highest quality of vinyl components on the market. However, pergolas come in different forms. You’ll need to decide which one is the best fir for you and your family. Lets discuss a few. 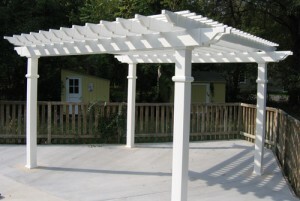 First, you have the option of a wooden or vinyl pergola. Mid Atlantic designed and built wooden pergolas for years. They can be very beautiful, but customers often had similar complaints. Wooden pergolas need to be stained and painted often, which some customers have difficulty keeping up with. Wood also invites much further weather and environmental damage, as well as insects. Lastly, the wood can have a distinct smell initially, which is sometimes troublesome to customers specific scent preferences. Wood can be beautiful, yet is undoubtedly much more maintenance and upkeep than vinyl. If you’re willing to put in the time and extra work, this might be the fit for you. Now lets discuss the less maintenance, more cost-effective and elegant version; vinyl pergolas. Vinyl is virtually maintenance free. There is no staining or painting required. They withstand wind, weather and environmental elements well, while insects are not an issue. All you would need to do is wash your vinyl pergola down with a simple soap and water solution once or twice a year and let it dry. That’s it! For your next set of options, we have attached vs. detached pergolas. Attached pergolas are tightly secured to the side of your home, providing extra structure and support for the pergola. It also saves your back porch room and is naturally closer to the back door or deck living space. Detached pergolas are also a popular option, because they give you just that; location options. With a detached pergola, you have the choice of where exactly you want it and on what surface you wish for it to stand. You can have it as large or as small as you would like and have it installed on your deck, yard or other flat surface. Mid Atlantic has been manufacturing vinyl fences and other vinyl garden products since 1999. We have taken the time and resources developing the finest vinyl pergolas one the market today, at a price point you can afford. All of our kits include a lifetime manufacturer warranty against fading, blistering, yellowing, chalking and cracking for as long as you own your home. We have multiple styles to choose from, so for more information on pergolas and the many other products we provide for your home, please visit our website at www.midatlanticdeckandfence.com!